They say the economy is on the mend, the worst is over, people are spending again. THEY clearly don’t live near my block in brownstone Brooklyn, where store after store on Smith Street, between Degraw and Douglass streets, has shuttered or moved on. 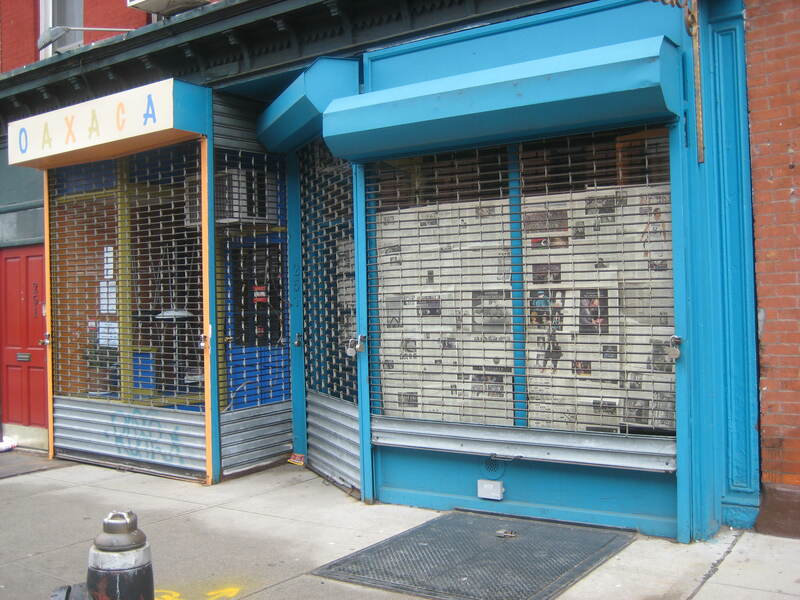 In just a few recent weeks, Stinky Bklyn has laid out plans to move further along Smith Street to bigger digs, while neighboring Salsa Salon shut up shop. Andie Woo, a quirky underthings store next to Oaxaca Tacos, also faded from existence. I should have seen it coming when I was in there on a Saturday afternoon in late February, taking advantage of the huge half-off sale. When I returned about a week later, the windows were papered over, the signs were down: it was all over. There may be one bright spot amid the shutterings though. I’m told the Andie Woo site is poised to reopen but not as a clothing store. Word is that it will be a deli similar to the famed Russ and Daughters on Manhattan’s Lower East Side, selling smoked fish and other deli treats. There’s no news on an opening date yet, but I’ll be tracking this one with bagel in hand. 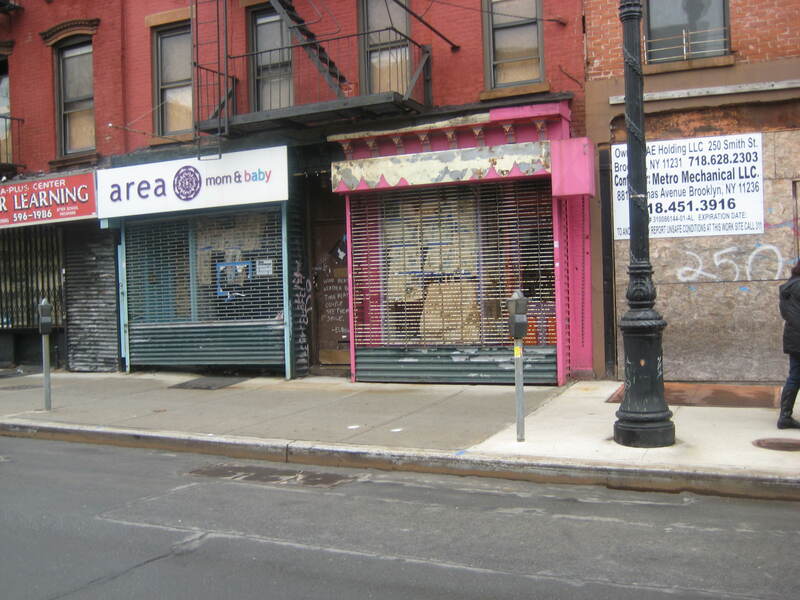 Meantime, there are now almost half as many boarded up shops or ones for rent on the Carroll Gardens block as there are occupied businesses. On the side closest to Court Street, for example, there are 10 storefronts, including the big empty lot on the corner that promises to become some sort of sprawling residential/commercial development, and only four actually in operation, Refinery and Video Free Brooklyn among them. Adding to the ghost-town feel, most of the stores are closed by 10pm or earlier, so it makes for a dark, desolate strip heading to or from the subway. As recently as 2009, the same block boasted the restaurant Patois, which has long been credited as a pioneer in getting Smith Street going. When Patois closed after more than a decade, speculation brewed that it would reopen across the street, but it never happened and the bistro took its business to Manhattan’s Little Italy instead. Provence en Boite opened a few years ago on the corner of Smith and Degraw, and the owners said they added sidewalk tables, a bench and flowerpots with hopes of creating a bustling corner and rejuvenating the block. Then came Stinky Bklyn and Oaxaca Tacos, and the block did indeed seem brighter. 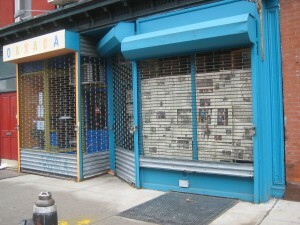 Thankfully Oaxaca’s original spot – now one of three in Brooklyn and Manhattan – seems set to stay. And Provence en Boite followed up almost a year ago with spin-off JB’s Burger. Not to mention elsewhere along Smith Street where mom and pop stores have been closing for years because of soaring rents and the ever-changing demographic of the neighborhood. They’ve been replaced in many cases with cookie cutter ice-cream shops and clones of stores already across the Gowanus in Park Slope. The comic book haven Rocketship and the Big Apple Deli across the street both closed recently, the doomed restaurant of many names – Banania, Porchetta, Carniceria – hasn’t been able to find a niche that will keep it open, and Brooklyn Camo, one of my personal favorites for rain boots and hiking socks, shutdown awhile back as did my drycleaner, which was replaced with another innocuous deli. Add to the list the Brooklyn Indie Market near Carroll Park, which has a For Rent sign on the weathered tent. They announced last month that after four years on Smith Street they won’t be back, even once the weather improves. And this is just a handful of the businesses that have gone in the few years I’ve lived in the neighborhood.